Grandma Minnie was 93 when she passed away on December 1st of 2006. She was an amazing woman who had lived by herself for more than 50 years on an 80 acre plot (in the middle of the Chippewa National Forest) in Northern Minnesota. For most of her working life she was employed at the local sawmill cutting timber, and picked wild rice for extra money. She befriended and named many forest animals like Deer and Humming Birds, and was visited often by Bears and Timber Wolves. She was one of 18 children and by herself raised five of her own. She lived life each day by breathing in the north air, rocking in her porch chair and telling stories about her past. She was a tough, loving, wise woman and she was all of my inspiration! I am her Granddaughter! The Granddaughter that she helped raise.. 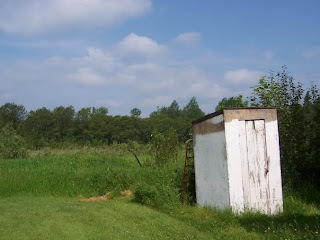 The Granddaughter that was not afraid to ask questions, that took tub baths outside and got to use her outhouse. I saw firsthand what being all by yourself meant, with not a moment of fear! In time I’d learn it was the most precious gift that anyone could ever have given to me in my life. The day of her funeral was the hardest day ever for me. I had not yet had a person leave my life through death, and there she was lifeless in front of my very eyes, not moving and just still. I expected her to jump up and be the loud laughing soul that she was. Instead there was silence. I turned that silence into what was real, which was me taking all she had ever shared with me and to share the story of her with anyone that would listen. It was also this very day that I found the biggest bucket of buttons... I thought I had found GOLD! 100’s and 100’s of antique buttons... Where had they come from ? What was their past and what coat or shirt were they once attached to? With most strings still intact, some rusted and dusty, it seemed these buttons held an enormous amount of history. I love this!!! I'm so glad I had the honor of not only meeting grandma but spending a whole weekend with her and hearing her stories!! She was an amazing woman!! I had a very similar grandma from MN, she lived to be 103 and guides me still to this day with the lessons she taught me - and the tins full of buttons that she left me. Only you could put it so meaningfully and beautifully. You're an inspiration to me, girl...always. Thank you for being the amazing person you are, and Grandma Minnie for directing you so well!